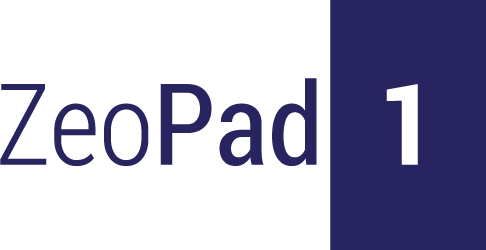 JOINTguard+ is a modern and fundamentally innovative complex for supporting and restoring joints and tendons that suffer from a wide variety of illnesses in which surfaces of the joints or the entire joints are either affected or subjected to degeneration. 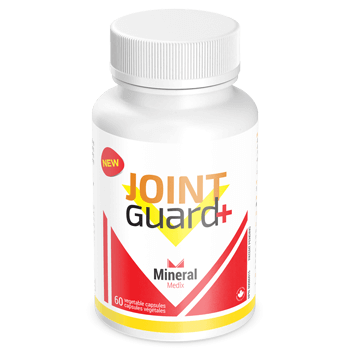 Besides the task of strengthening and restoring damaged joints’ surfaces, JOINTguard+ also has the function of promoting the inhibition of local inflammation in the joint area. What are the purposes and operative tasks of this natural complex? Arthritis means “inflammation of the joint;” the joint is the location where two or more bones come together. There are more than 100 types of arthritis, but all of them involve localized inflammation of varying intensities. According to official statistics, tens of millions of people suffer from at least one type of arthritis, and even more never turn to a doctor for help. The number of registered cases of arthritis has almost doubled within the past 20 years, and the trend of diagnosed cases seems to be on the rise with each year. Estimates show that about one-third of people will experience arthritis symptoms at some point in their life. Joint damage due to the aggressive nature of the inflammatory process is the most frequently seen result of arthritis. With this in mind, anti-inflammatory ingredients are expected to be present within any complex targeted at maintaining joint health. On the other hand, it is essential for any strategy for dealing with this dangerous disease to provide the maximum support for the body’s internal restorative ability. These two goals are the primary tasks of Mineral Medix’s JOINTguard+ complex. 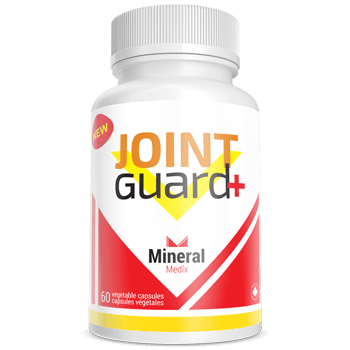 Fighting and reducing the negative factors of local joint inflammation while simultaneously supporting and even stimulating the body’s restorative functions are the main ideas with which the ingredients in the JOINTguard+ natural complex from Mineral Medix were selected. JOINTguard+ is a natural, multicomponent complex, capable of positively affecting the process of joint restoration and regeneration as well as having the capability of counteracting destructive inflammatory factors to which human joints are subjected to at the time of certain illnesses. Natural ingredients that have a double-action within the body and a non-traditional approach to supporting the body’s restorative functions using bioactive silicon (which promotes synthesis of the body’s collagen) are the key differences of JOINTguard+ from Mineral Medix when compared to standard remedies. Adults: Take 1 capsules 3 times daily. For use beyond 8 weeks, consult a health care practitioner. If you are taking anticoagulant, antiplatelet, hypotensive, or other medications or supplements, consult a health care practitioner prior to use. If symptoms worsen, consult a health care practitioner. Do not use if you are pregnant, or breastfeeding, if you have bleeding disorder, hypertension, or infertility issues. Discontinue use if nausea, vomiting, headache, or urticaria occurs. Store in a dry place in a tightly sealed package at the room temperature. Keep away from children. A few weeks ago I ordered Liver Guard and Kidney Guard, as soon as I placed my order I realized I made a mistake in my error. I quickly contacted Mineral Medix and they got back to me in just a few hours. They were extremely helpful. Great customer service! I’ve never used supplements before because I didn’t believe there would be results. But when my friend wouldn’t stop telling me about how much he loved using Mineral Medix’s products I felt like I had to try them myself, and I am so glad I did. I typically never leave reviews, but after using Kidney Guard I couldn’t help but rave about my results. I’ve gotten many urinary tract infections in the past few years, and not only is it uncomfortable it is also annoying. I needed something that would help me because I was sick of taking antibiotics. I tried Kidney guard a few months ago when I had a UTI and my symptoms were much more manageable than normal. I’ve been using Kidney Guard ever since and haven’t gotten a UTI, the only product that has truly saved me. 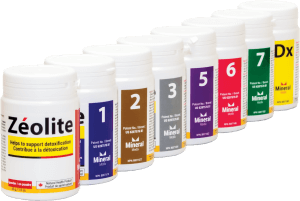 As a health conscious person I am very glad I found Mineral Medix. I only use natural products, so it has been great using supplements that I know are benefiting my body. Ever since I was a teenager I was prone to migraines and as the years have passed they have gotten worse. They got so bad that I would miss days of work, which not only frustrated me but also my boss. My close friend who also deals with migraines introduced me to Cardio Guard, god bless his soul because this product has saved my life. My migraines have almost disappeared completely, and when I do get them on the rare occasion they are much more manageable and don’t affect my daily life as they use to. If you experience migraines, I would definitely recommend you try Cardio Guard. Being a vegetarian, I find it challenging to find products on the market that not only suit my needs but also my dietary restrictions. When I came across Mineral Medix I was so happy to find out that they were vegetable capsules. I love that Mineral Medix offers products that have great results and fit my personal needs. I’ve never used supplements but after wanting to improve my health I decided to try them out. The only problem was I had no idea what I was doing. I came across Mineral Medix and loved that they were natural, but because I didn’t know much I decided to email the company to ask their opinion about which products best suited me. I told them what I was looking to improve, and within the same day I got an extremely helpful and detailed response explaining what works best for me. I love that this company genuinely cares about their customers and goes out of their way to help.